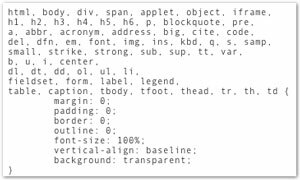 Last year Eric Meyer documented his thoughts on resetting the styles of a web page to a common baseline. For designers who crave pixel-perfect layouts, differences between the default styles that each browser applies can be infuriating, and this was a terrific approach to leveling the playing field in the quest for an identical render across all browsers. … not a case of â€œeveryone must use these styles in a certain way without alterationâ€�. Nor am I saying that everyone must use them or else be cast into darkness. Remember before that I termed these â€œmy take on the topic of reset stylesâ€� (emphasis added). Your take may be subtly or greatly different. … over time, Iâ€™ve come to realize that this is more than just a throwaway development tool. It really is the beginning of a baseline style sheet. (Or can be.) Things like boldfacing and italics are some of the most obvious textual effects readers will see, and to have reset styles that treat them inconsistently across browsers doesnâ€™t make sense. Thanks Eric, for delving into the frustrating world of browser-specific styles and stamping them out so that we don’t have to!